There’s a hard-hitting report out today from the Center for Public Integrity peeling back the layers behind the Outer Continental Shelf Governors Coalition, a group of primarily Republican governors pushing to allow off-shore drilling in Atlantic waters. While the message from the governors that morning [a February meeting with U.S. Interior Secretary Sally Jewell] would have come as no surprise to Jewell, less clear, perhaps, was that the governors were drawing on the research and resources of an energy lobbying firm acting on behalf of an oil industry-funded advocacy group. Indeed, the background materials handed to the governors for the meeting, right down to those specific “asks,” were provided by Natalie Joubert, vice president for policy at the Houston- and Washington D.C.-based HBW Resources. Joubert helps manage the Consumer Energy Alliance, or CEA, a broad-based industry coalition that HBW Resources has been hired to run. The appeal for regulatory certainty, for example, came with a note to the governors that Shell, a CEA member, “felt some of the rules of exploration changed” after it began drilling operations in the Arctic. McCrory, a former Duke Energy executive, does not come off looking very good, with a mention of his spokesman contacting the private industry-backed firm to ask how to answer a reporter’s questions about the group led by McCrory. It also sheds more light on a closed-door meeting McCrory and his administrators held in early November about opening the waters off of North Carolina’s shore to drilling. The article was reported largely through public record requests to governors’ office. 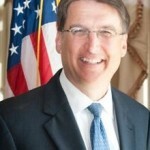 Notably, North Carolina and McCrory’s office had not turned over its share of records to the Center for Public Integrity reporter. Representatives of the governors coalition have maintained that it is an open and transparent group that strives to include different viewpoints. But the Center was only able to learn the details of the organization by submitting records requests — which North Carolina still has not provided — and there’s no evidence that opponents of drilling have been invited to any meetings. Indeed, critics point to that North Carolina meeting earlier this month as the perfect illustration of what’s wrong with the way the governors coalition operates. On Nov. 6, North Carolina hosted a meeting on the five-year planning process that focused on the Atlantic. Officials from the Department of Environment and Natural Resources told journalists and environmental groups that the event was invitation only and that “neither special interest groups nor industry representatives” would be present. That was true in regard to environmental groups — but apparently not for others. During the event, reporters waited in the halls of Raleigh’s Nature Research Center as state and federal officials listened to panel discussions that featured, among others, a CEA staffer and someone from the Center for Offshore Safety, an industry group. It is disheartening that Governor McCrory has allied with the Consumer Energy Alliance whose fraudulent anti-solar energy activities have been making news in Wisconsin.